I found this shirt on sale at Forever 21 last year for $3.00 and it has been a favorite of mine ever since. 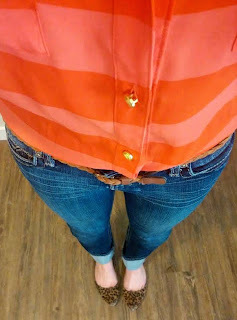 I opted for a pretty casual look by layering it with a button up shirt under it, jeans and flats. I wanted to keep it simple for the weekend. 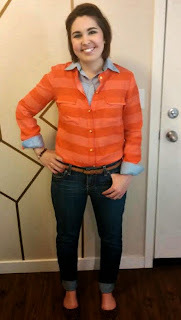 Funny,I wore orange and pink today too and was going to title my blog post this too haha. I love the top! You should check out my latest post,Rachel said you liked kate spade too and I went to the outlet last week and got some stuff! Yes I do love Kate Spade! I will definitely check it out. Thanks! Yeah I'm crazy about kate spade too. Hey have you been to the new arc of Spokane downtown? It's super nice and they always put out the nicest stuff. I got a brand new pair of born boots and teva sandals. You'd like it. I have had two trips planned to go there but plans have changed both times. It is on my list to check out soon though! It's a really nice thrift store-a really big space. Everything is brand new or gently used. I'm looking forward to a blog post about it.